Never assume. Sunday night, I neglected to go outside to verify the degree of drifting in the driveway, after the day of strong wind. From the house, we could see the tops of trees swaying dramatically, but by afternoon, there was very little in the way of obvious snow still being swept up by the gusts. We stayed in and watched the Oscars. 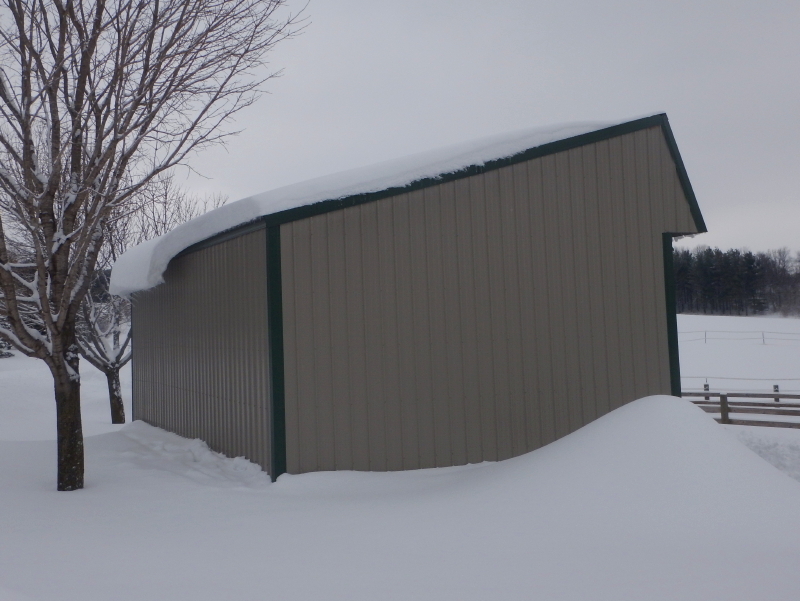 It turns out, drifts grow even when the blowing snow isn’t visibly obvious. I got up at my usual work-day zero-dark-thirty and did my routine of planks and stretches, then dressed and headed out the door into the predawn darkness. From the house to just beyond the hay shed, there was no change from when I plowed the day before. 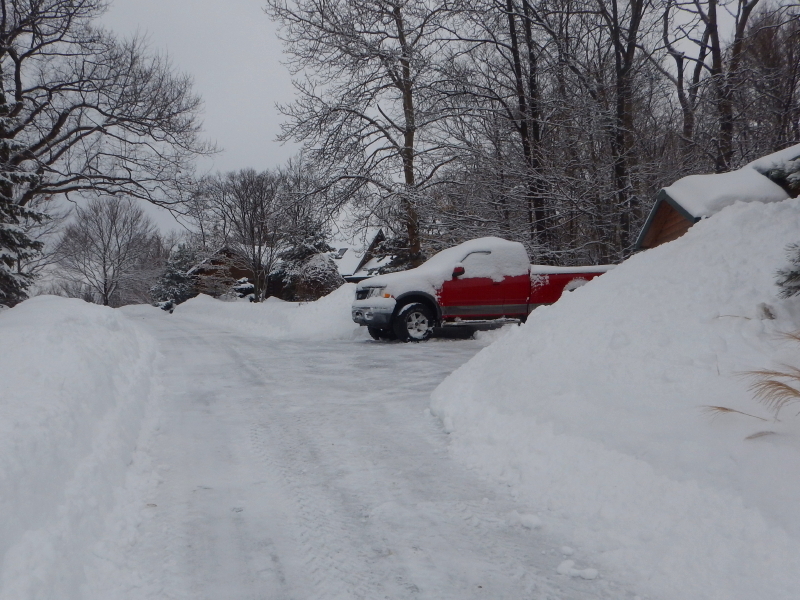 As I climbed the hill before the road, the cleared portion of driveway narrowed. Drifts can be really deceiving. Driving toward them, it’s difficult to discern whether it will be soft, or packed solid. It can also be hard to tell whether they are going to be higher than the clearance of the car. 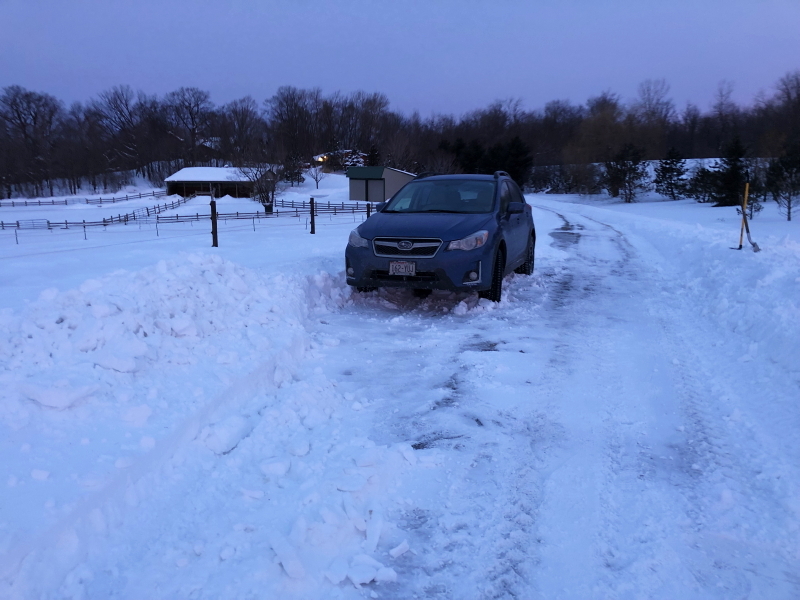 Since my Crosstrek has been performing so superbly thus far this winter, I forged ahead in hopes of breaking apart the drifts just enough so Cyndie would be able to drive her car out after me. She needed to leave early to lead some training for staff at a school in St. Paul. 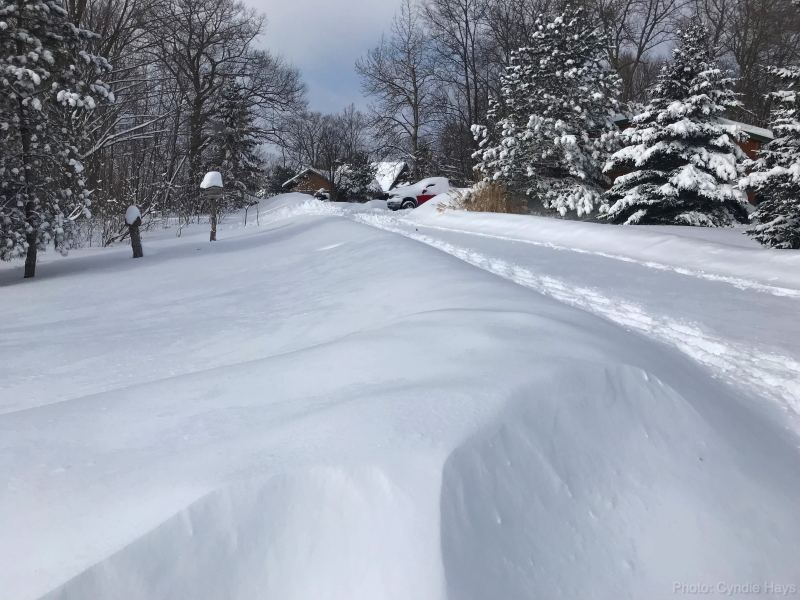 It turned out that the drifts had grown significantly since I plowed, they were packed into a very firm density, and they were just tall enough to rub the bottom of my car. Cyndie would never be able to get out in her car, even if I broke through all the way to the road. Didn’t really matter. I couldn’t break through. Near the top of the hill, forward progress stopped. I tried rocking forward and back, but the car-length I achieved backward only moved me deeper into the drift. I got the car stuck. I would need to plow. Of all times to be forced to plow, this was really inconvenient. It was dark, I wanted to get on the road to beat traffic, and the air temperature was -5°F with a windchill around -35°F. I was dressed for work, not for being outside. I intended to make this quick, but circumstances did not allow. The ATV wouldn’t start. The battery was sapped by the cold temperature. I popped the seat off and found the battery was covered by a mouse nest made out of pilfered bits of fiberglass insulation. Nice. The battery charger was inside the frozen truck, so I had to wrestle with getting the doors open and trying to unwind the inflexible cables. With the jump, I got the ATV started and headed out to clean up just the bare minimum to get our cars through. The drifts were too dense for the relative light weight of the ATV to push through. I ended up lifting the blade and “paddling” forward on the deep treads of the winter tires, just to break up the drifts. When I got down to the road, I could see that someone had driven by and smashed through a huge drift by our mailbox. The road was almost as bad as our driveway. 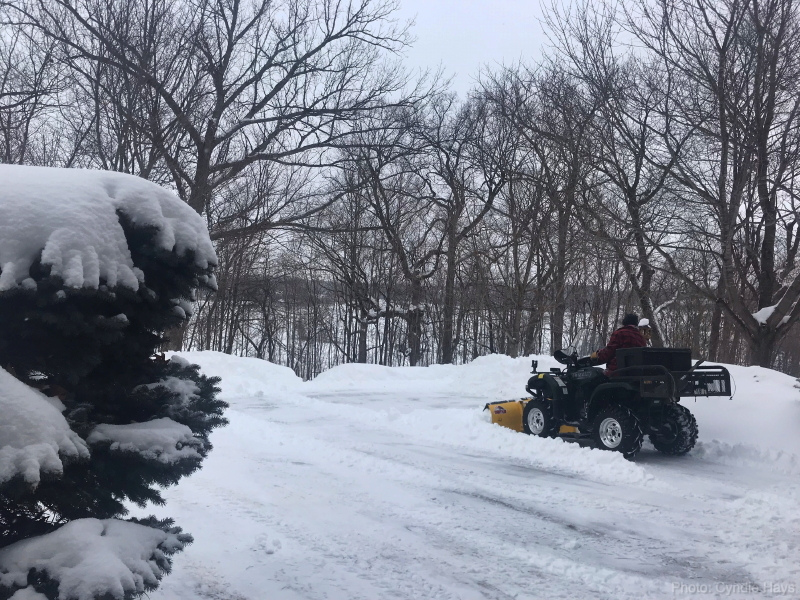 I successfully made several difficult trips back and forth over the hill, each time trying to move a fraction more snow with the blade, but I was a long way from plowing it clean enough for Cyndie’s car to make it out. Then the cable that lifts the plow blade broke. At that point, there was nothing else left to go wrong. I blame the frigid temperature. It adds difficulty to everything you try to do. At least the sunrise provided an entertaining backdrop. I was close enough to being done when the cable broke that Cyndie and I were able to shovel a path out of what remained of the busted up drift. The clearing we achieved was so narrow, I could hear the side of her car rubbing the snow as she drove through the skinniest section, but we both made it out in the end! This story holds no surprises. There was so much snow to be cleared from our driveway and paths and roof top, that it consumed our attention from the moment we woke up yesterday. We are now dealing with the most snow since we moved here in 2012. We are devising new ways to pile snow, finding new places to push it, and sacrificing non-essential spaces that were previously cleared. When you can no longer lift it over the pile, you start pushing it up against the pile. Preparations actually started last week, when we received around 9 inches on Wednesday. I had to plow in such a way as to make room for what we already knew was coming this weekend. 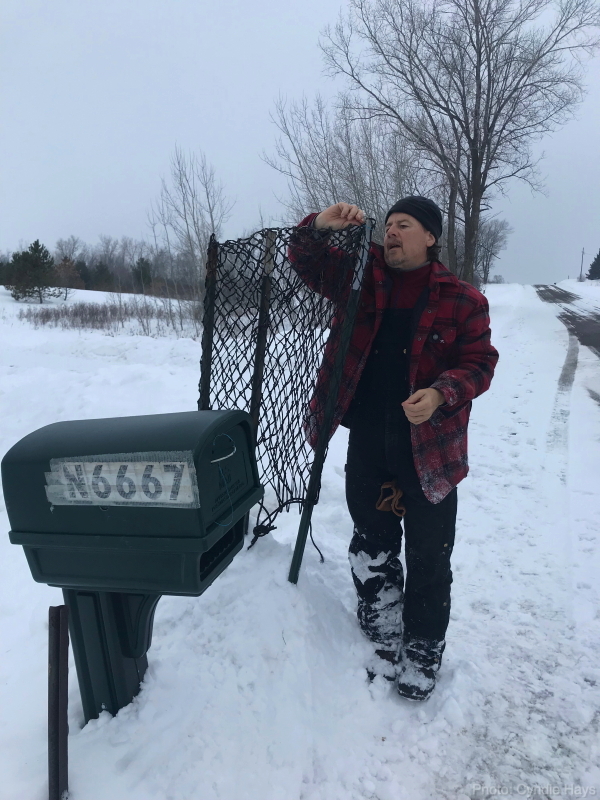 Saturday, we tried building a snow screen out of the netting of an old hay feeder bag and three t-posts, to soften the blow our mailbox suffers when the township plow zooms past. Well, maybe it worked a little bit. The mailbox still popped off the base, but now that I think about it, instead of flying far into the ditch, it just flopped over behind the post. It didn’t start snowing until after dark Saturday night, but Cyndie said it was coming down pretty heavily when she took Delilah out for her last walk of the night. When I got up in the wee hours of the morning, the wind was whipping the snow to the point it completely covered the screen door to the deck so I couldn’t guess how much new snow had fallen to that point. By the time daylight arrived, new snow had stopped falling. The remaining flakes still airborne were being blown by the gale force winds, occasionally forming mini-tornado spirals, and carving sweeping waves of curving drifts. I’m pretty sure we are going to remember the record-setting amount of snow that fell in February, 2019 for many years. I do it every year. 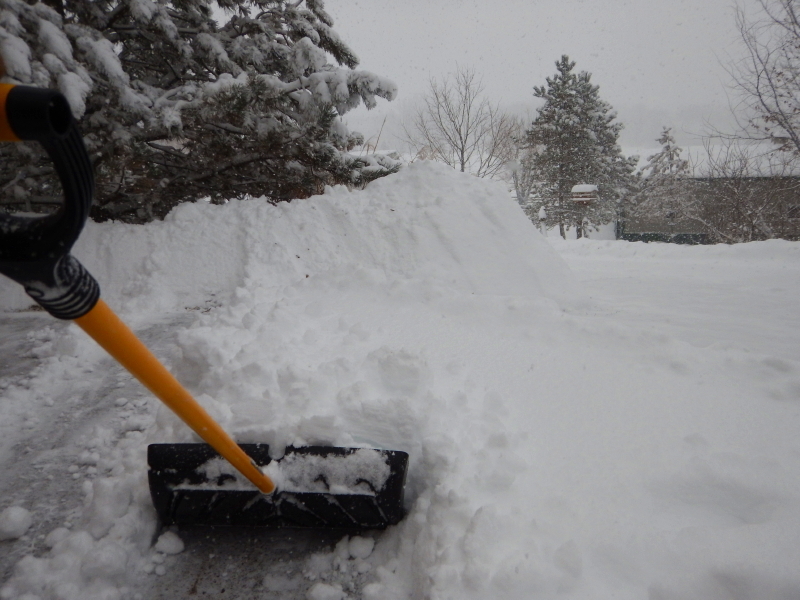 At the beginning of the snow season, when I plow and shovel snow, I take great care to maintain order. On the gravel, I lift the blade to avoid pushing rocks far into the grass, in hope of saving my mower blades extra abuse in the summer. 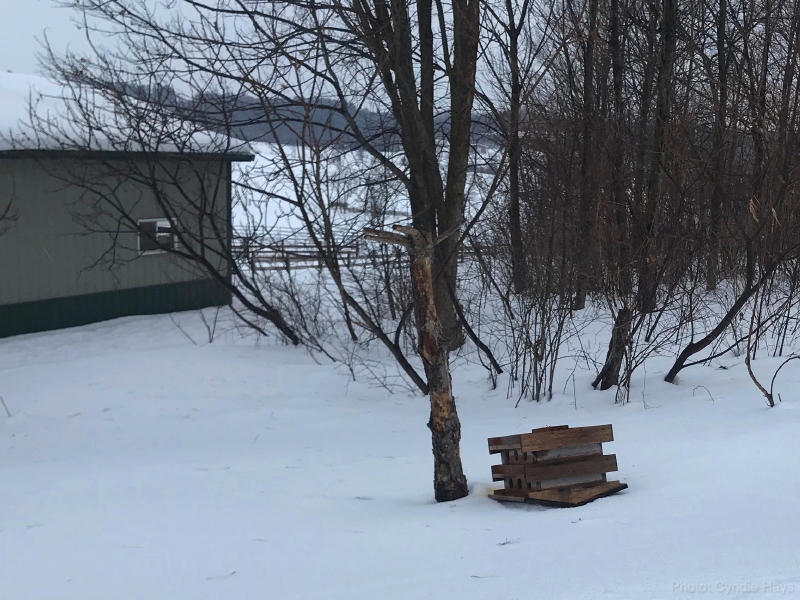 By the house, I pile the snow away from the swinging bench and brush the snow off the seat to create an inviting place to sit and watch the activities of birds and squirrels. There is a reason for every decision, and order abounds. By February, the importance of those decisions has shifted significantly, and the new focus is on moving snow at any cost. The rocks are an unfortunate consequence of the newer priority of just getting this snow out-of-the-way. The bench becomes a place to store snow, not a place to sit. It is my perspective that has changed about what the value of these things are. I care about some details up to a point, and then I no longer care. 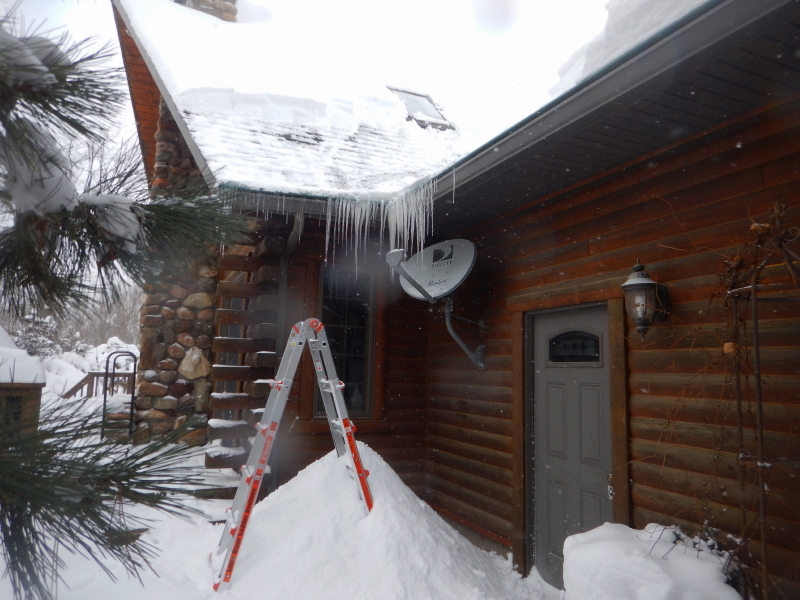 I had the ladder out yesterday, scraping the latest covering of blown and fallen snow off the edges of the roof. It’s a laborious effort, balancing on my arches on that narrow rung of the ladder, while holding my arms over my shoulders to maneuver the rake on the end of the three 4-foot aluminum pole sections. Back and forth, reaching up, pulling back. While taking a pause to rest, I became mesmerized by the steam rising off the roof where the sun was heating up the dark shingles. 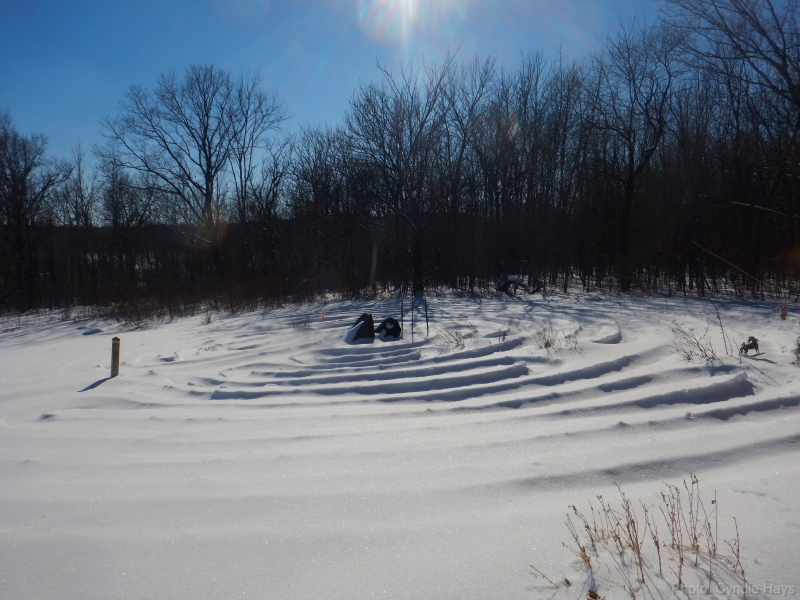 It was well below freezing, yet that solar energy was melting the snow as fast as ever. I pulled out my pocket camera in hopes of capturing the wonder of the phenomena that had so captured my fancy that I was happy to remain even longer on that precarious perch, soaking up the scene. I have no idea how I also captured the corner of my sleeve. How did it even reach up into the frame? It doesn’t make much sense to me. 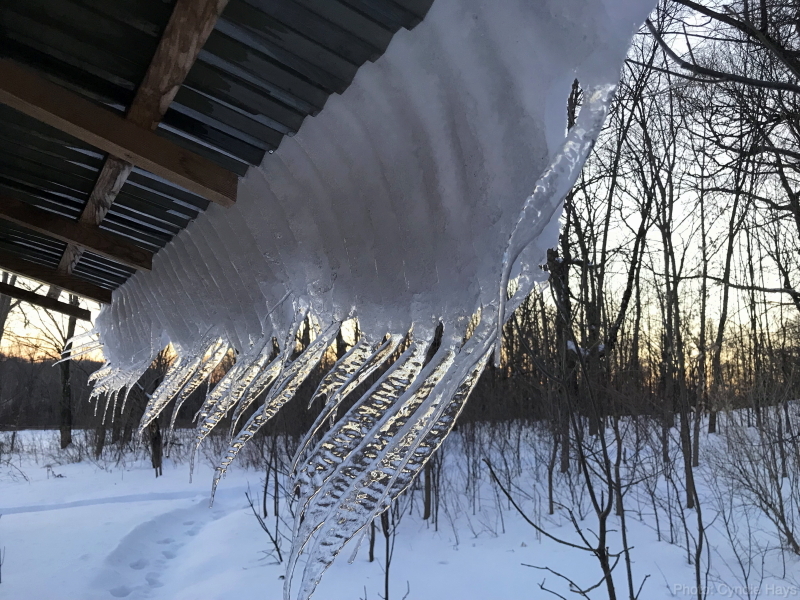 Notice how the impact of the angle of solar intensity is evident by the melt occurring on the right, versus the roof slope on the left. Most of the year, I would fret over physical abuse to the shingles, but this time of year my perspective has evolved. 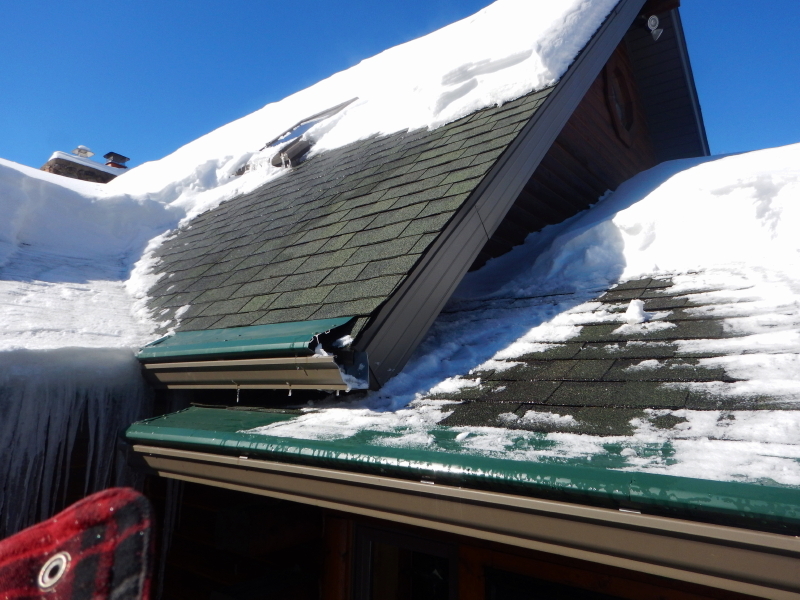 I’m willing to drag metal across the granules of shingle in order to remove that insulating layer of snow that will create ice dams that lead to bigger problems. I am not one to rigidly cling to a single way of seeing most things. Everything is always undergoing change, including my perspective. To heck with keeping up, I’m ready to give up. The snow-pocalypse of February wins. I can only endure so much, and it turns out, unending accumulation of plow-able amounts of snow in close succession is more than my fragile mind can handle. 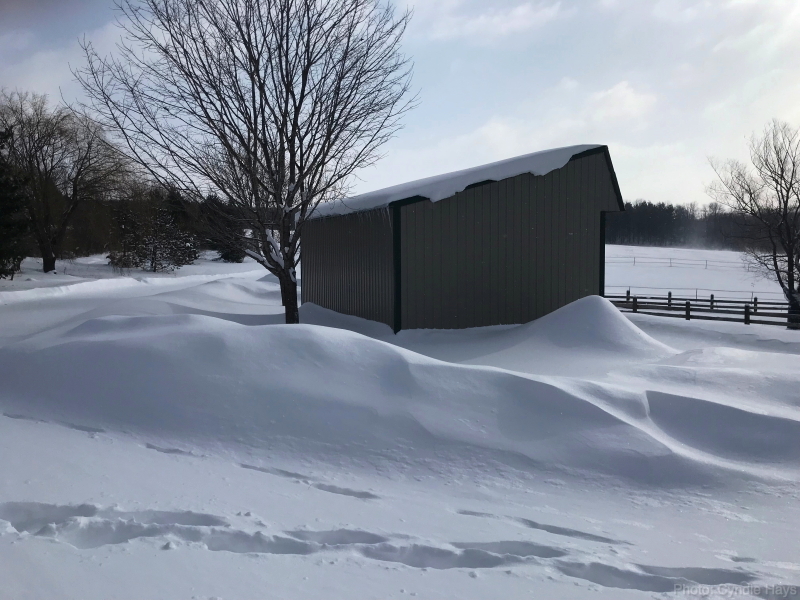 It takes a certain mental discipline to clear the quarter-mile of driveway from the house to the road, then around the hay shed and in front of the barn, when the snow is falling fast enough to cover your progress as fast as you make it. That’s alright. 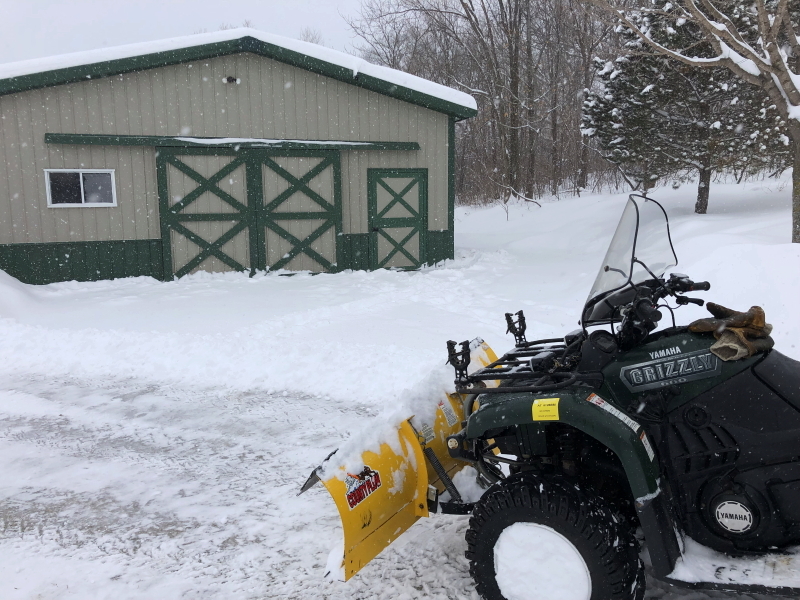 After the year when I waited until the snow was absolutely stopped before plowing, and there was too much for even my big tractor to clear, I learned that it would be smarter to plow whenever we get 5 or 6 inches, even if it was still snowing. But it is very rare that it would take more than two sessions of plowing. Until now. I am officially drained of my stoic Northland resilience. Is this one of the ways that zombies are created? I am but a shell of my former self. 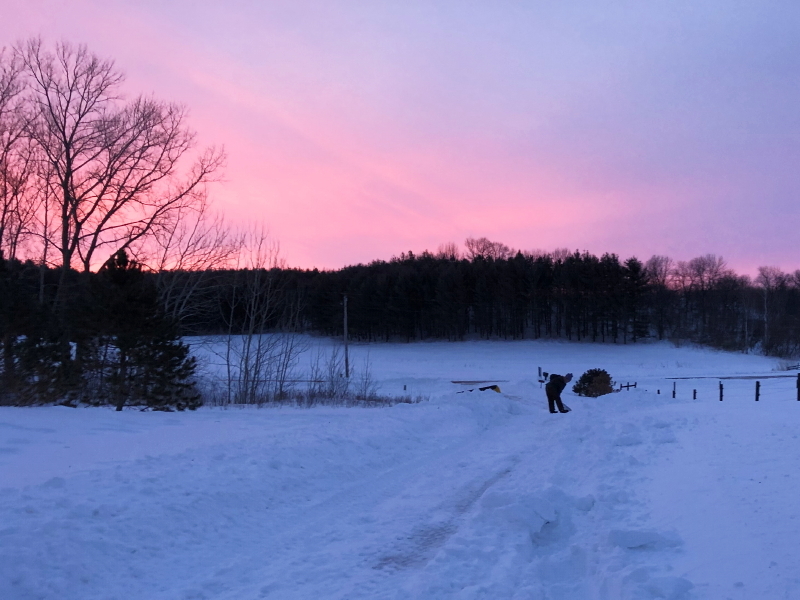 In the fading light of day, I found myself stumbling up the driveway from the barn, dragging a shovel behind me, while the snow continued to fall. There is no space to push more snow. At the end of the day yesterday, the wind started to pick up and create drifts. Of all times for us to need more gas, it happens in the heart of a big snowstorm. I stayed home from work yesterday, and the highlight of the day for me was that I wasn’t driving my car on snowy roads. Then I needed gas. Out I ventured onto the drifted roads in my car, frowning. 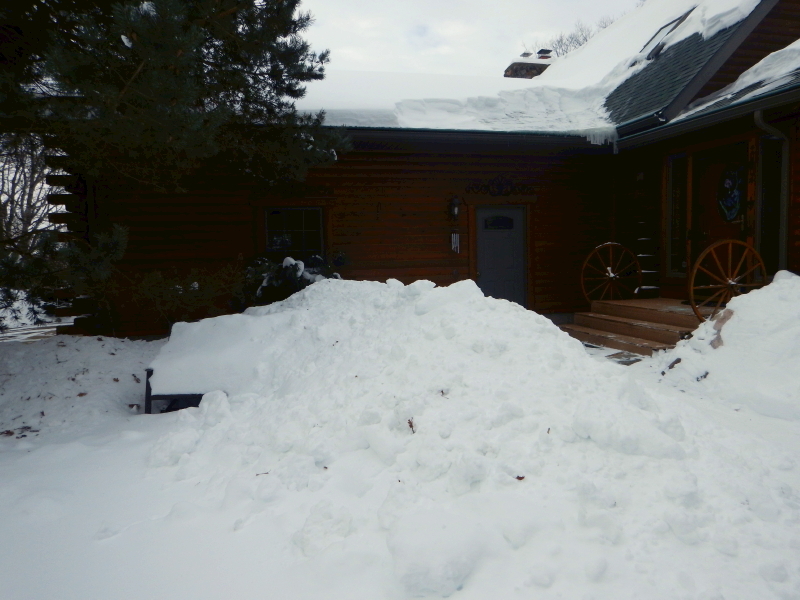 This battle all played out after I had spent the early part of the day raking snow off the roof, and then needing to shovel the giant mound from our front steps. 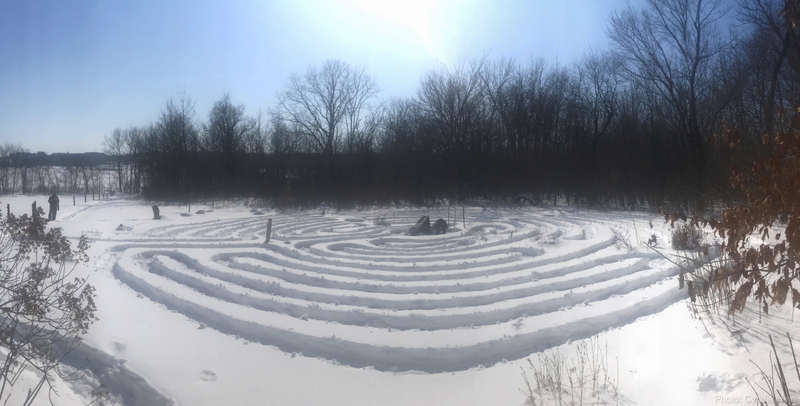 It was exhausting work, but when I finished, it seemed like the snow was letting up, inspiring me to move on to the plowing. I even saw a glimpse of a bright yellow circle in the sky, through the clouds for a few seconds. It didn’t last. 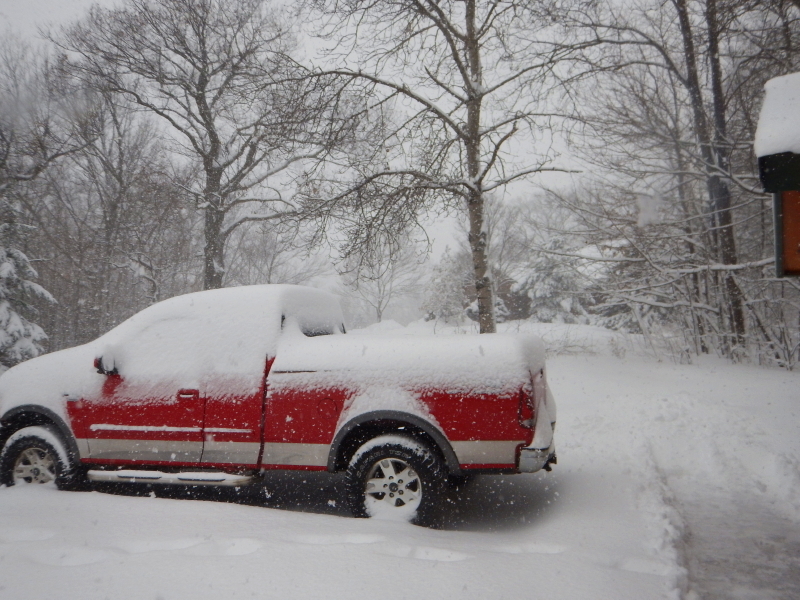 Halfway through plowing, the rate of snowfall picked up dramatically. That was pretty much the point that my brain threw in the towel. The rest of the plowing was devoid of my usual attention to detail. There are options that would serve to remedy my problem of having nowhere to push more snow: a snowblower attachment, for one. Visiting Cyndie’s parents in Florida for several months is another possibility. I wonder if they would mind if we brought all our animals along. 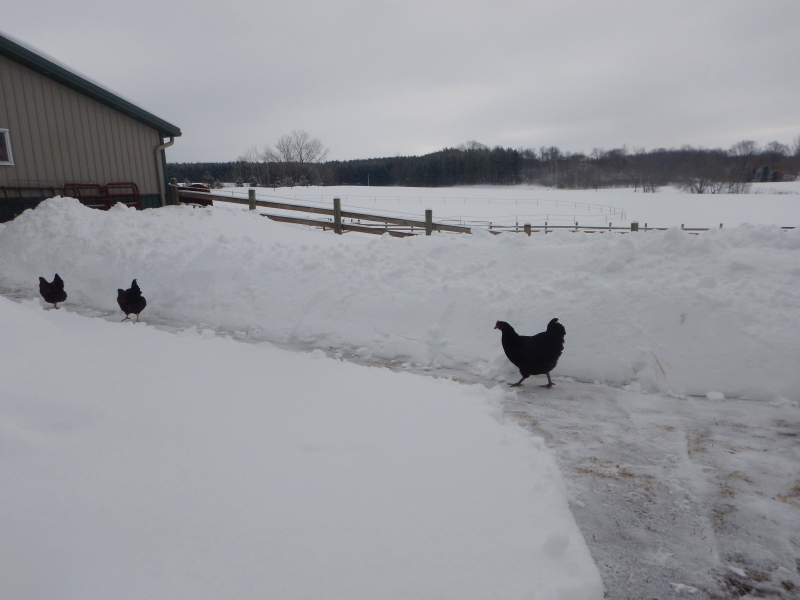 I think the horses and chickens are all about as done with falling snow as I am. Winter decided to dump a big snowfall on us over a very short amount of time yesterday. I knew it was going to be enough that I should get out in the middle of it to plow at least once before it was all over, but I wasn’t sure when that would be. It took longer than we expected for the snowfall to start, and then the accumulation built rather slowly to about 2 inches. The next time I glanced outside from my perch by the fire, that amount had more than doubled. It was time to get out and plow or else it would be too late for my plan of working with reasonable amounts of snow. As it was, the Grizzly ATV, as a snow plow, was just barely capable of the task. The first thing I did was get it buried and stuck sideways off the edge of the pavement where all four wheels just spun on the icy layer below. I needed to dig out all the snow packed underneath it, and then spin those tires until I gradually slid sideways enough to become mobile again. After that, I decided to stay focused on just opening up the main driveway as wide as I could get it. The Grizzly does not command full control when trying to push large amounts of snow. 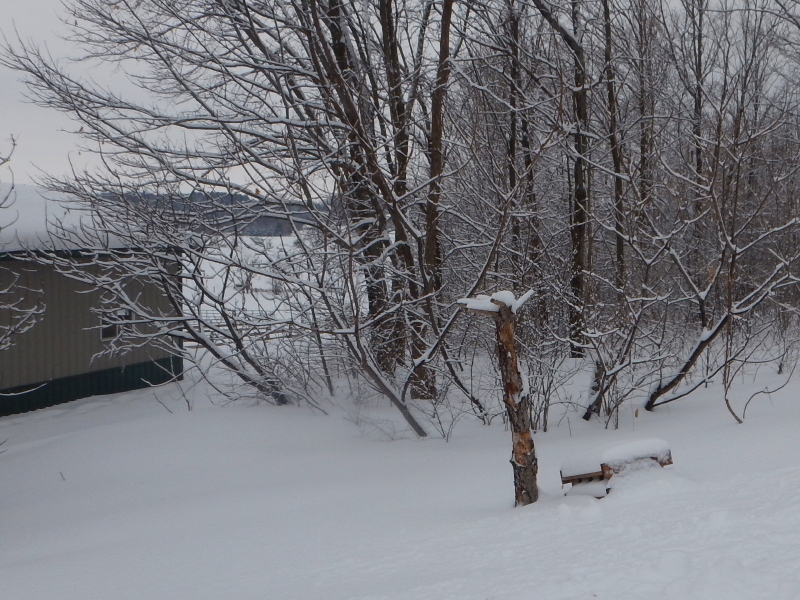 The snow pushes back and tends to dictate what progress can be made. I tried making more passes, while taking smaller bites with the blade each time, but the outer edges just grew unwieldy and the snow rolled back down behind me, such that I wasn’t really gaining much added width. 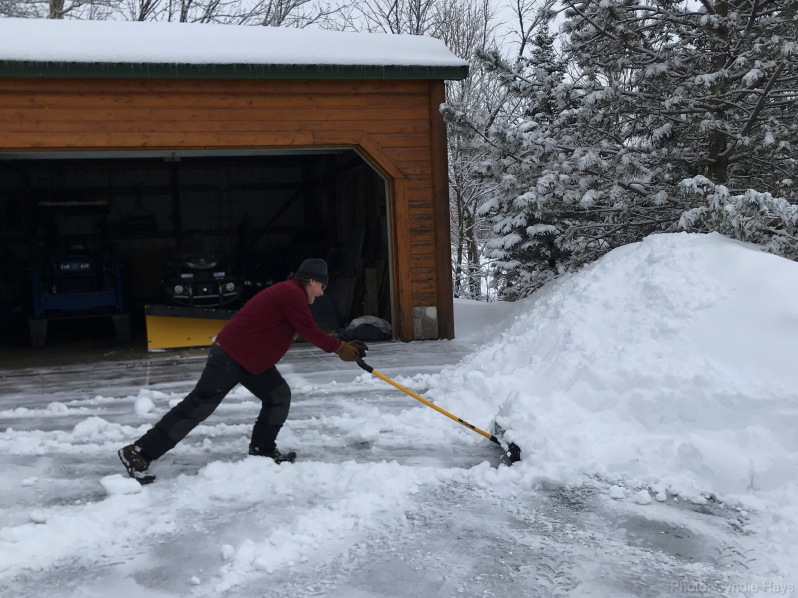 In the areas of tight confines, we resorted to hand shoveling, which allowed me to toss the snow up over the massive banks that quickly developed. The snow was coming down at peak rates of multiple inches per hour while we worked, covering our tracks as fast as we made them, but every shovel width made was that much less snow I would need to move by the end of the storm. Cyndie was working up around the house and I was by the shop garage. I watched the county plow truck make two passes in front of our property which meant there was going to be a new pile at the end of the driveway to clean up. 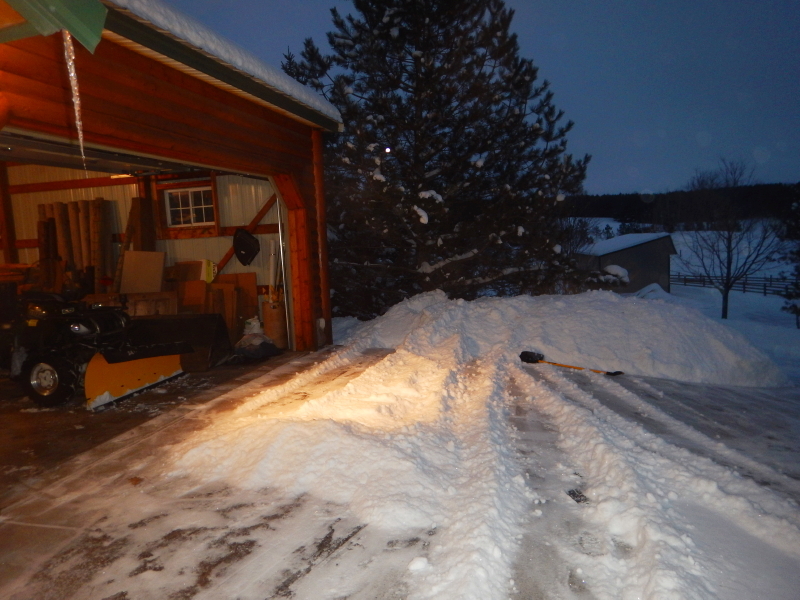 Cyndie headed to the barn to put the horses in for the night and I finished cleaning edges where she had shoveled. Cold, wet, and tired, I was ready for a break, but I noticed the falling snow had slowed considerably. It would be dark soon and there were already three fresh inches on the driveway in the hour-and-a-half since I first plowed. I started up the ATV again and cleaned the driveway a second time. Of course, doing so throws snow in a couple spots that need to then be cleaned up by hand shoveling. My gloves were soaked through and I so wanted to be done, but there was a dog waiting anxiously to be let out for her afternoon walk. Make that “run.” Delilah dragged me along as fast as I could trot as we headed down the plowed driveway while she searched for any opening to explore. There were none. 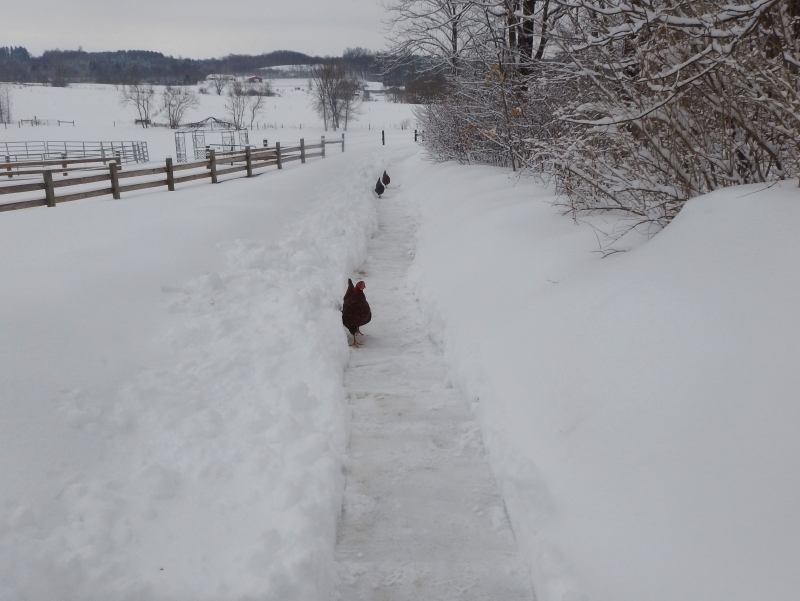 It was down the driveway and back, except for a couple surprising leaps into the deep snow that she quickly aborted. I measured 9 inches while shoveling, and I could see we got at least 3 more by the time I plowed the second time. It fell hard and fast all afternoon. I definitely made the right decision to stay home yesterday. That was a really big dump.